Passive microwave sensors on satellites have monitored the extent of the sea ice cover since 19782. This technique is widely used to investigate fluctuations in ice extent over the seasons, variability between years, and longterm trends. The seasonal variation of ice extent is much greater in the Antarctic where there is about six times as much ice in winter as in summer. Currently, in the Arctic, ice approximately doubles from summer to winter. 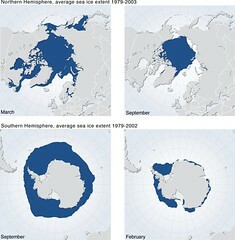 This figure presents sea ice extent from 1979 to 2002/2003, based on passive microwave satellite observations. The two polar regions are drawn to the same scale.